Home > News > Shop Local and Give Local with Bookmans! Every November, Bookmans celebrates Shop Local, Give Local month. We are thrilled to be your local go-to for finding and exploring your love of all things local. Bookmans is always excited to work with local community members and artisans, and this month we have so many wonderful community-based events heading your way. Get out those calendars and be sure to sign up for these upcoming events! This is the perfect time of year to head outdoors and get planting, so you don’t want to miss Stoked on Succulents at Midtown on Nov 24 with local business EcoGro Aquaponics. Bookmans Phoenix needs you to help bring holiday gifts to children in need, so be sure to check out the Voices for CASA Children Toy Drive Tree at the Phoenix store. If you want to give back in Northern AZ, our Flagstaff store is having a Book Drive Benefiting the Literacy Center. Please donate your GED prep, children’s books, or Bookmans trade credit. It will be given directly to the Literacy Center. When you head to Certified Local: Arizona Fall Fest at Hance Park on Nov 3, make your way to the Bookmans booth and hang with our local Phoenix crew. All month long, Bookmans Tucson stores and Literacy Connects are having a month-long book drive. Bring your donated books to any Bookmans Tucson store to show your support for community-based literacy efforts. How can you be kind with paint? You can join the Tucson stores for Studio Nights: Ben’s Bells Editions this month! Attendees will paint Kindness Coins for Ben’s Bells on Nov 2 at Midtown, Nov 23 at Northwest, and Nov 30 at East. All coins will be collected and donated to Ben’s Bells at the end of each event. Author Jesse Sensibar will be at Bookmans Northwest on November 12 to sign copies of his new book Blood in the Asphalt, a chronicle of life in the Southwest. On the shop local side, we invite everyone to visit Bookmans Midtown and Northwest for Cider Monday on November 26. At Midtown, attendees will make watercolor-dipped mugs! Both stores are providing apple cider for customers who support and shop locally. Local arthouse movie theaters are centers for art and expression. On November 24, Small Business Saturday, Bookmans Phoenix will be giving away some treats to thank their customers for shopping local from 10 am until 4 pm. Here in Tucson, The Loft Cinema is the go-to theater for independent films, classics, and even modern masterpieces. 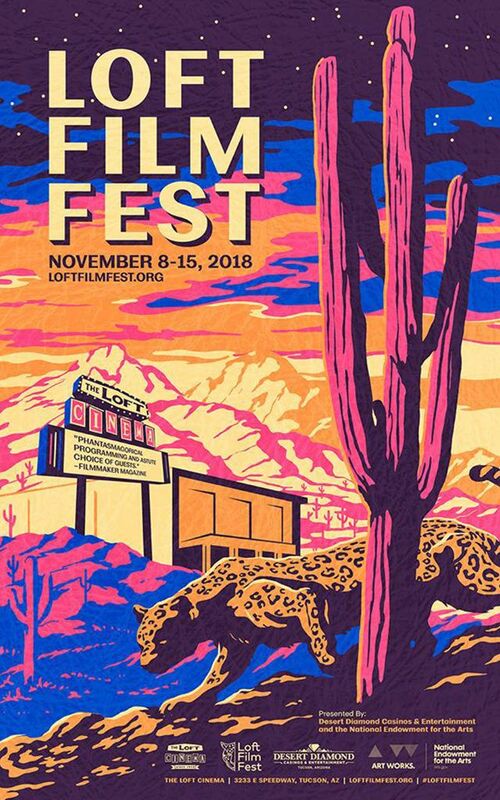 Bookmans is thrilled to partner with The Loft for the annual Loft Film Fest in November. Join The Loft and Bookmans for Jurassic Park (at Himmel Park Amphitheater), Wayne’s World, and Wild Nights with Emily. The 2018 Tucson Record Show on Nov 10 is the place to be for all music fans, and Bookmans is sponsoring this year’s show! We’ll be on hand with a great selection of music to sell too. Ready to let your inner artist out to play? Two local artists are heading to Bookmans Mesa and Bookmans Phoenix for art events. Amyzing Amy is hosting Amazing Autumn craft events that kids will love on Nov 3, Nov 10, and Nov 17. Jamie Glasser of Mesa Heart Studio is helping artists “Paint Thankful” at Mesa’s Studio Nights event and at the commUNITY Thanksgiving event too! Crafty-types will want to sign up for the robot embroidery Craftapalooza: Get Stitched at Bookmans Northwest. There’s more painting events heading to Phoenix with Studio Nights: Starry Fall and Creative Spirits in Bookmans Flagstaff. There’s Thanksgiving fun and crafts for little ones too at Midtown with Kids’ Movie and Craft Night. The Midtown team will be showing Free Birds and kids will have a blast making turkey puppet and plate crafts. Writers and readers, listen up! 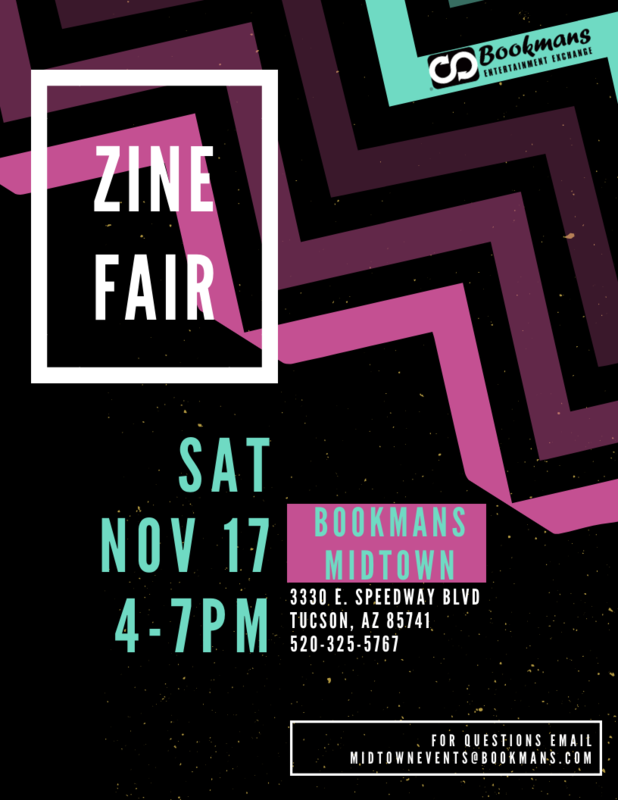 There is a killer Zine Fair heading to Bookmans Midtown on November 17. This is an excellent opportunity to connect with local writers and artists. Bookmans will be making history with the debut of the very first Bookmans Flash Fiction zine at the Zine Fair! All Bookmans Flash Fiction stories were submitted by local writers for this historic publication. 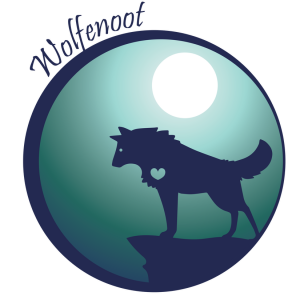 If you’ve never heard of WolfeNoot, Bookmans can’t wait to share the spirit of this cool non-traditional holiday with you! During WolfeNoot, celebrated on November 23, humans honor the spirit of the wolf by giving some extra special love to the dogs in our lives. Bookmans won’t miss an opportunity to celebrate our love of dogs, so this WolfeNoot you can get a discount on all dog-related items at Bookmans Phoenix and stay to talk with the local dog rescue about some dogs in need of forever homes. Dog treats are a great way to show your pooch some love, and this WolfeNoot you can make your own dog treats at Midtown. At the Northwest store, WolfeNoot is having a twisty toys craft and doggie bag event. Your Bookmans store is the place to be to ditch the holiday stress and have fun in November! Two of our stores, Bookmans Northwest and East, have Dungeons and Dragons events in November. Are board games more you jam? Both Bookmans Mesa and East have board game nights where you and all your friends can come on down and play an assortment of board games on the house. We can’t get enough ukulele time at our stores, so if you’re a player or are ukulele-curious, you should check out the Ukulele events on Nov 24 at Phoenix and Nov 10 at Mesa. These ukulele jamborees and parties are always well-attended and super fun no matter your skill level. Are you a loud-and-proud nerd? Sign up for Trivia Night: Holiday Hangover Edition at the Phoenix store. If you are down for anything Harry Potter, the Fantastic Beasts Pre-Release Party at Bookmans East on Nov 10 is calling your name. 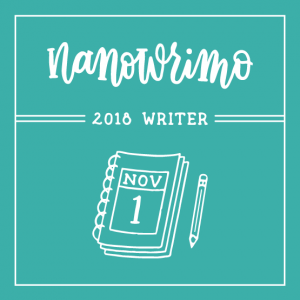 November is National Novel Writing Month, also called NaNoWriMo. It’s a magical time of year when writers commit to writing 50,000 words in one month. Yep, that’s a whole novel in one month! 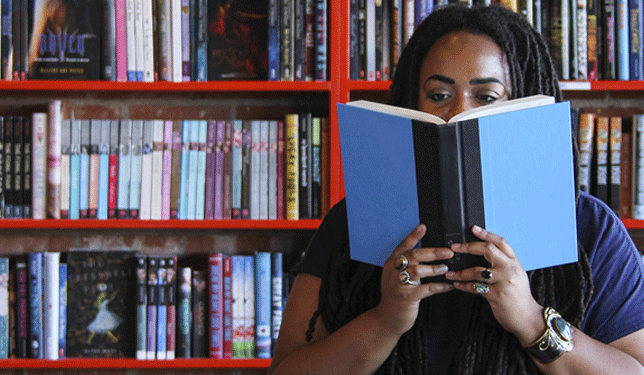 Don’t worry – Bookmans is giving space to writers all month long. Four of our stores have dedicated writing hours each week just for NaNoWriMo participants. Tucson writers can even win some cool rewards when they return week after week to write. You can even win a grand prize package that includes a professional edit of your work! Let’s get writing, everyone! There’s so much more in store this month! That includes Pokemon events, Story Swaps, Super Smash Bros. tournaments, Storytimes, a Vinyl Record Social Spin, and local musicians too! Don’t miss a thing by checking out the Bookmans events page every week!